Bogota is an amazing city that will leave you speechless with its lively streets, incredible culture, delicious food and friendly locals. It’s the perfect place to get to know the Colombian culture and experience its authenticity just by walking the streets and enjoying the city the way locals do. You may decide to stay in La Candelaria, the historical district of the city. Or in Chapinero, a trendy area full of bars and restaurants, where you will be close to everything you’ll want to see while in Bogota. Quinta Camacho is also a very interesting area, it’s a little quieter than the rest of the city, but you’ll still find bars, cafes and restaurants. If you are looking for a more bohemian and artistic place to stay, the neighbourhood La Macarena is the place for you. Here is our list of the best hostels in Bogota, from party hostels to the best hostels for solo travellers, we guarantee you’ll find the perfect hostel for your trip. Vamonos! Botanico Hostel Bogota is famous for its beautiful colonial house, large tropical garden and amazing views of the city. The terrace its known for hosting amazing parties where travellers from all over the world come together. The garden will be your favourite place to relax after a night partying! How to get there: If you come from the airport you can catch a taxi to the hostel. The normal fare is 25.000 COP (10US approx. ),If you prefer to take a bus you can catch a ‘transmilenio alimentador’ from the airport to ‘Portal Dorado’ station,.From there, you can take any bus with the letter ‘J’ to ‘Universidades’ Station or ‘Las Aguas’ Station. Fatima Hostel has the best vibe you could ask for when travelling solo. The restaurant/bar often host parties open to the public, perfect to meet locals and get an authentic Colombian experience. You will also be right in the city centre, close to the highlights of Bogota! To help make your morning easier after partying at the hostel bar, Hostel Fatima offers a super-healthy breakfast with traditional Colombian fresh fruits. How to get there: You can take a taxi from the airport or a bus that goes to “Germania” and get off at 19th street, by Carrera Tercera. Aurora Hostel is located in Quinta Camacho, the old part of Chapinero, where you’ll find the charm of the old Colombian houses mixed with the lively neighbourhood’s night life. The hostel is really homely and you and your partner can enjoy some privacy for a little romantic time in Bogota. You’ll still be able to meet other travellers in the common areas. If you really want to take romance to another level, make sure to book the private room with a suite and a vertical garden. Yes, vertical garden, you read it right! station “las Flores” and from there walk just 400 meters to the hostel. You could also take a taxi, which will cost about 30.000 COP to go to Quinta Camacho. Some of best things about Bogota happen between the touristic attractions. Bogota is a city full of life that you have to truly immerse yourself in, to understand the culture. Chapinero Hills Hostel is located in Chapinero, a neighbourhood known for its diversity, trendy cultural spaces and authentic Bogota vibes. You will be perfect located to explore museums, plazas, theatres and experimental bars and restaurants. Start your day with a fresh homemade breakfast made by the chef Cesar, then head into town following the hostel staff’s amazing tips. A cultural and romantic holiday is guaranteed here! How to get there: If you are travelling from El Dorado International Airport by car, you can take the following route: Avenida el Dorado > Carrera 50> Avenida Calle 63>Carrera 16. It will take approximately 50 minutes (13). Republica Hostel Bogota offers you the opportunity to live like a local while staying in Bogota. Located in Zona G, the gastronomic district of Bogota, you can easily explore the best coffee shops, restaurants and of course the city night-life. The staff is are really friendly and helpful, they will give you the best tips to explore the area. At the end of the day, you can just relax in the hostel bar and chat about your day with other travellers. How to get there: Take the Green shuttle at the airport, called ‘Alimentador’,which will take you to the ‘El Dorado Terminal’ for free. When you get there, you can buy a pre-paid card to use at Transmilenio (red buses) system. Buses run until 11 pm. Be sure to ask at the Terminal the quickest route to ‘Flores Station’ as they vary depending on the time of day. Alegrias Hostel is located in the historic district of La Candelaria, close to the main sites in Bogota. This friendly hostel has the perfect vibe for you to meet other people and immerse yourself in the Colombian culture with some Spanish and Salsa classes. Enjoy the free breakfast and hammocks in the outside area. If you are feeling like treating yourself, you can even book a massage, hair cut, manicure and pedicure directly on the hostel! How to get there: You can either get a taxi or a bus. From the airport, the taxi will cost you about 25.000 COP. If you decide to take a bus, it will take about one hour. First take the free green bus from the airport and from there get the red bus to Station Universidades. Located in the Candelaria district, in the historic centre of Bogota, Masaya Hostel will give you a true immersion into Colombian culture. You will be staying in a traditional colonial house and have a great time at Salsa classes, live Colombian music and art exhibitions. The bar/restaurant and three outside areas are great for socialising with other guests. We are sure you’ll find a partner to enjoy the dance lessons with! How to get there: From the centre, take the north-bound colectivo, marked ‘Terminal’ from Carrera 10 anywhere between Calles 19 and 26. You can also take a bus or colectivo from Calle 13 west of Av Caracas. SC House hostel’s goal is to make you fall in love with Bogota while staying in great hostel for a fair price. Travellers rated it ‘fabulous’, so you can’t argue with that! Enjoy the hostel’s great location, in the heart of La Candelaria neighbourhood. The common areas are full of activities, so it won’t be long before you’ve made new travelling friends. How to get there: You can travel to the hostel by Transmilenio (a red bus), and the closest station is Las Aguas. However, the hostel suggests you take a taxi or book an airport pickup, which they are happy to arrange for you at a good price! El Pit Hostel is located in Macarena, one of the most traditional neighbourhoods in Bogota, known for being bohemian, artistic and extremely full of life. There is no better place to stay while exploring everything this vibrant area has to offer. There are so many cafes, restaurants and bars, but don’t miss the famous Mercado de Las Pulgas (flee market). The hostel offers bike tours, cooking classes and yoga classes, perfect to meet other like-minded travellers. Finish your perfect day having dinner at the hostel restaurant, while enjoying a beer with your new travel buddies at the bar. Salud! How to get there: You can take a bus called Alimentador during weekdays, the L10 bus on Saturdays and L97 bus on Sundays and holidays. They all stop very close to the hostel. Fernweh Photography Hostel is a true gem for backpackers that love photography. They have their own gallery showing incredible travel photos to inspire you. If you fall in love with a photo, you can even buy it and take it back home as a super-authentic souvenir. You will stay in the heart of the city, La Candelaria. So, it’s the perfect location to explore the most interesting parts of the city, like El Chorro de Quevedo. It’s the place where Bogota was founded back in 1538. How to get there: From the airport you can take a free bus called “Alimentador” to Portal Transmilenio El Dorado. From there, take a Transmilenio (a red bus) and get off at “Las Universidades Station”. It will only take you 7 minutes to walk to the hostel! Anandamayi Hostel is a true paradise for those looking for a chilled and relaxing time in Bogota. After spending the day exploring the city you can come back to a beautiful garden with waterfalls, fish ponds and even hummingbirds that like to hang out there. Just when you thought it couldn’t get more idyllic, they also have an attic where you can watch the sunrise and hear the bells from the old churches. How to get there: The nearest bus stop is just two blocks away – take theTransmilenio (red bus) and get off at the Avenida Jimenez bus stop. If you come by taxi remind the driver that the old town is mainly pedestrian, so they should take the Calle 9 route from the Avenida Circunvalar. The name ‘Sue’ comes from the ancient Chibcha language and means traveller. The Hostel Sue was made by backpackers, just like us, and they take their mission to offer backpackers the best Colombian experience for an affordable price, very seriously! You can expect a free breakfast, hostel bar with cheap drinks, communal kitchen and daily activities to explore Bogota. If you are really lucky you may even get free entries to the best parties in Bogota! How to get there: You can take a taxi from the airport for about 30,000 COP. They also have their own Sue van to pick you up, for the same cost as a taxi. 12:12 Hostel will pop up your Instagram feed with its super-cool interior full of books and bikes. But, the books are not only there for decoration, it’s a library and you can also exchange books with other guests, making it the perfect excuse to start a conversation. The big communal table is also ideal to talk with other guests during dinner time. If you feel you need some guidance to explore Bogota, 12:12 has its own travel agency with many options for activities and helpful staff ready to give you the best tips. How to get there: A taxi will cost you around from the airport to the hostel. If you want a private car to pick you up, the hostel can arrange that for you. Have you stayed in an amazing hostel in Bogota that is not on the list? Let us know in the comments! 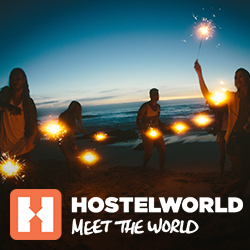 The post The best hostels in Bogota for your trip appeared first on Hostelworld Blog.